Bulgarian heavyweight pride Kubrat Pulev (22-1, 12 KOs) continues his way back to the top of the world boxing standings by crushing Maurice Harris (26-21, 11KOs) with a thunderous knockout of an 8 round fight on Saturday midnight in Hamburg. In front of thousands crowd at INSELPARKHALLE in Wilhelmsburg, The Cobra (#5 in WBC) destroyed his American opponent with a single body shot in Round 1 after just 108 seconds of play. This was his second consecutive victory in the last month and a half after after winning by a decision over Brazilian George Arias on October, 17th in Karlsruhe. “I thank all Bulgarians. Big thanks to these, who came to support me in Hamburg and to those, who crossed their fingers for me in front of the TV. I was prepared excellent tactically and physically. I’m glad that I managed to keep my hand, which is still not fully recovered and at the same time to take such a convincing win. I expected much stronger resistance from Harris. Now I’ll take a short rest before starting my preparation again to attack one of the main belts in an year time from now”, said Pulev, who arrived in Sofia last night and is expected to be back in charge in the beginning of spring. 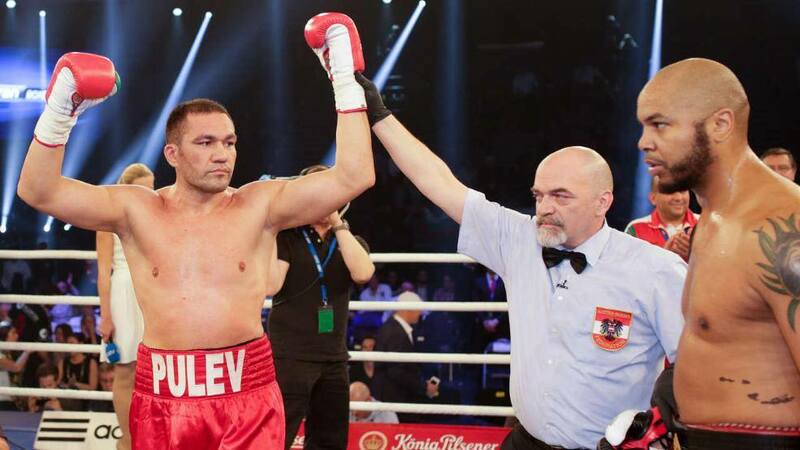 Pulev posted his 22nd triumph and 12th knockout. He made it using the unique pair of patriotic gloves in the colours of Bulgarian flag – white, green and red. The gloves have been sewn by “Adidas” for the big world title fight against Wladimir Klitschko in November 2015. Unfortunatelly then Kubrat was forced by his opponent not to use them. This is the fastest knockout, that Bulgarian boxer makes in his professional career so far. Once he sent Maurice Harris on the floor in Hamburg, he raised hands, kissed his gloves and was embraced by his happy coach Ulli Wegner, who was able to sit in Pulev’s corner for the first time since they start working together early in February.